By heartofthesouth, August 7, 2008 in INTRODUCE YOURSELF! My name is Amber and I am 26 years old. My family found out on Friday that my Nanny has inoperable stage 4 NSCLC. She went in for pain in her gallbladder and was having problems breathing. Further tests were done and here we are today. The cancer has spread to both lungs, brain, colon, abdominal wall and lymph nodes. She is no longer able to have her gallbladder removed nor the surgery that she was already scheduled for on her heart because she would not survive the surgery because of the tumors in her lungs. She is 72 years old. She had her second full brain radiation today and the Dr's do not know if she will be able to handle the chemo (SP?) yet. I think at this point they are going to wait on the chemo and try radiation to her lungs. They have told us at this point with the cancer the only thing they are trying to do with the radiation is shrink the size of the tumors in her lungs to help her breath a little better and to keep it from spreading further in her brain (right now it is two spots and one really small spot). This is the first time I have ever had to face someone in my close family having cancer as I am sure a lot of you are in the same situation. I am young and having a hard time trying to understand everything the barrage of Dr's are telling us. I am keeping a note book and trying to write down everything they say when they come in to her room so I can look it up later on the internet. But as you all probably know when you are at the hospital the entire day and hearing a bunch of "i don't knows" or "we have to talk to the other dr's" everything starts running together and it gets quite overwhelming. I'm in fight mode at this point. Trying my hardest each night after I leave the hospital to search the internet for any information I can find. I am being realistic with the situation because of her other severe health problems it limits what the Dr's are able to do for her. But I guess in a way I am also fighting the inevitable because it's just too hard to even begin to think about...even though it's on my mind every minute of the day. I'm scared. I've prayed more the last 6 days than I think I have in my entire life. Not for a miracle cure or anything but just the strength to deal with whatever may come our way and for her to have as little suffering as can be. I feel like I really don't have anyone to talk to because I'm so afraid of upsetting the family. Your story touches my heart and I am so sorry to hear about what your grandmother is going through. If chemo is not an option what about Tarceva? Did they mention that? How are her pain levels? Is she comfortable? 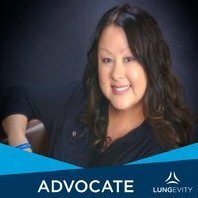 Here is a website that you could pose any lung cancer questions you may have to a reknowned lung cancer specialist. It is a great site with a wealth of information. Welcome to our online family and prayers for you and yours. I am so very sorry you had reason to find a site like this but so glad you found us. Please know that we are all here for you and we will do our best to help answer your questions and offer you support and advice. The website Jamie gave you is an excellent resource and you will also find a lot of great help there, too. Please keep posting and let us know how we can help you.. Welcome to the forum. So sorry you found the need to be here. You will find lots of support and information here. Please continue to post and keep us updated on your nanny's progress. Hi Amber. Sorry to hear your Grandmother has this terrible disease. It must be very difficult for you trying to understand everything that Doctor's are saying. Even the medical terminology can be overwhelming. Taking notes is a great idea. You will find great support here from people who " get it". Please keep us updated and ask any questions you may have. We aren't really sure what they are going to do about Chemo. They said on Tuesday they had to meet with her cardiologist and pulmonologist (SP on both?) to see what the options are going to be yet we still haven't heard anything from anyone...2 days waiting in the hospital...I will update more later if I find anything out and thank you all so much for the wealth of information you have provided on the site and all the well wishes I have already received. God bless. Amber, I have three grandsons, one with whom I am very close. I'm eight years younger than your grandmother and I pray every day that I can live until he's old enough to handle it. He's only nine but your post reminds me we are never old enough to "handle" the threatened loss of someone we love. The best you can do is try to be there with her and for her in whatever time she has. You'll find on this site many who have survived long past expectations and with a host of other medical issues. And Amber, let me give you one piece of advice based on recent experience. If you need information about your grandmother's cancer, rely heavily on this site and cancergrace.org where Dr West and colleagues will answer your questions quickly and without charge. Most of the searching I did on the internet just misinformed or scared the jeebies out of me. Thank you Judy. I don't take much stock in most of the things I read on the internet...learned that from battling my own disease. The main thing I look for on the internet is just to pretty much educate myself on the topic and terms about NSCLC. God bless. Well my dad decided for the sake of my own health it would be best to take the day off from being at the hospital. My family will be there this evening to talk to the Dr's but I guess he is afraid the stress is just getting too much for me to handle on top of my own health problems. I've been making sure not to let my Nanny see anything that has been going on because I don't want her getting any more upset than she already is. That's good. You rest and let someone else take over tonight. I'm sure they'll fill you in on all the details. So I stayed home from the hospital (pretty much against my will) to get some rest today. Yet even with the rest I was walking down the hall and blacked out again. Twice in one week and its starting to worry me. I was getting kind of worried because none of my family had called to tell me how my Nanny was doing today. Finally around 9:00 p.m. my uncle called to tell me she had taken a bad turn. Her stats are really low...dang it I knew I should have went to the hospital. The Dr's have now said there will be no Chemo. Her body just can not handle it. They will be doing 16 sessions of full brain radiation and 14 sessions only on her right lung. They don't want to do too much radiation...they just want to shrink down one of the masses in her lungs to try to help her breath a little easier. She has now had three sessions of full brain radiation and one session on her right lung. We were hoping she would be coming home soon but now with her taking a bad turn they do not know when or if that will happen. They had her do a living will today and she has asked that she not be brought back or kept on any life support. I don't know...I guess I just feel like if I am there with her I can some how protect her and I know that's not being realistic. I guess it's just guilt trying to sneak it's way in since I wasn't there. Welcome to the group. As you can see we are a very supportive and infomative group. Amber (we're all assuming that's your name because someone addressed you that way in a post? ), I'm with Ned, there was nothing you could have done to help Nanny to not take a bad turn. But go see her now if it will make you feel better. I'm sure she'd appreciate seeing you. Please call your doctor and have that passing out thing checked. First, though, are you eating properly. Lots of people don't when they are stressed and that's the first thing I think of with passing out. Also, are you getting plenty of fluids as it can be a symptom of dehydration as well. Unfortunately I don't have insurance and the free clinic said it's not a medical emergency so it would take over a month to get me an appointment. I have been eating very healthy and drinking lots of water...water is actually all i drink except for the occasional cup of coffee. When they brought me to the ER when I collapsed at the hospital they said my blood pressure was perfect and so was my blood sugar...so I can't even begin to think what the heck is going on with me...hopefully it is just stress. I'm going to be heading up to the hospital here in a little bit to sit with my Nanny. My mom just called me...my Nanny has decided that when she passes she is donating her body to Science and signed the papers yesterday evening. While my family is sooooo proud of her for wanting to further NSCLC research we have been told that it could take a month or maybe even longer before her body is released back to us for a funeral. That part my family is not very happy about. Has anyone dealth with this before? Or do you know if that is a pretty accurate time frame? And last but not least. Thank you all for talking to me. It's the only comfort besides my prayers that I have been able to get whith everything going on. If your grandmother has donated her body to science, they won't be returning it at all; and it might be a year or more before they return her ashes (once they are done with body, the remainder is cremated). My family plans on a memorial service (no body needed) and I've told them I don't care whether they claim remaining ashes or not (the family is not required to do so). Well I just got home and had my questions answered while I was at the hospital about donating her body. The college will have her body for one year and then we will receive her ashes. I am so very proud of her for doing this. I don't know...there are some mixed emotions but either way we are proud of her. She asked today if we understood that she was going to pass soon...I'm not going to say it was easy to sit there and hear those words come from her mouth. We watched the olympics and she had a gleam in her eye and said, this will be my last time watching them and I'm glad it was so pretty...(the opening ceremony). It's so hard not to cry. I have to leave the room often. Most of the day was spent laughing about old times and strolling down memory lane. It was nice. She's getting confused every now and then and the Dr's did warn us about this. In home hospice care came by and talked to use and we will be keeping her at home. Her stats are still low so we don't know when she will be coming home. Hopefully soon. I guess we need to trust your Nanny to know what's happening, but even to an outsider this all feels so fast. It must be so difficult for your family to absorb all of this so suddenly. You and your family are in my thoughts. She had been going downhill for quite some time but the Dr's all kept saying it was just her heart...they never checked her lungs until last week. I'm hoping she will make it till at least the end of the year...I would love to be able to have one last Christmas with her. She seems to kind of act like it will be within the next couple months though and I am hoping for longer. Amber, consider it a real blessing that she has opened up the channels of communication as she has. So many people don't for one reason or another, and things that need to be said don't get said. What a joy to talk about the old days -- the high points that are still so vivid, the disappointments that have mostly faded, the fun times, even some of those embarrassing moments. Whether she's with you two months or much longer, you'll always treasure this special time. I know this is so hard for you. Cherish these memories with your Nanny - they will hold you through the times to come. Your pic of you and your Nanny is so precious - I can see the love you have for her. She is so lucky to have you. Another warm welcome Amber. You have already found that we are a caring supportive bunch. Best wishes on your journey. I've been reading and watching your posts about your nanny and all that your family is going thru. I just wanted to let you know that you were in my thoughts and my prayers. I'm so sorry for all that has happened and for all that you and your nanny and family are going thru.